All business is iterative. In fact, so is all of life. This means we need to learn to let go of perfection in favor of motion. We have this crazy idea that we live in a linear world where everything has a clear beginning and end point. But in truth, we cycle around continuously, as the seasons turn, doing, adapting and shifting according to a changing environment (both inner and outer) . . . and doing it again. This is how biological evolution works. It’s always been happening, and it will always continue. Similarly, our businesses go in cyclical phases, travelling around the wheel. And here’s the best part – when we finally relax into this reality, it’s a huge relief! We realize that we don’t actually have to figure everything out all at once – things will naturally evolve and change over time, becoming more and more suited to the environment around them. We simply can’t force it. Things take time to evolve. That’s a big load off, right?! This principle of iteration holds true for the overall evolution of our business, for our niche, and for our programs and services, which we’ll focus on in this article. So What is a Beta Test? A beta version, beta test, prototype, or simply a test run, are all words for the first cycle or iteration around the wheel. What is the simplest way I can put out a quality program to try out my idea in as little time as possible? There’s a popular idea in the tech start-up world called The Lean Start-Up, which defines a beta program as a Minimum Viable Product (MVP) and the process of using a build-measure-learn feedback loop. While it started with software products, the concept quickly spread to other industries. It’s evolution from the heart of Silicon Valley – you build something, measure how it does based on feedback in the marketplace, learn from it, and then rebuild (you know it as version 1.0, 2.0, etc). What is the pared down or bare bones version of my epic program? What elements can I leave out that will make it easier for me to just get it out there now but would not sacrifice the goals of the program? Can I test out a program one-on-one before offering it to a group? Can I teach my course live before attempting to package it up into an online course (a must-do if you ask me)? Can I teach a daylong version instead of an 8-week course? Can I use a cheap or free venue to host my event? Or do something non-residential before planning a big retreat? Can I offer a free or low-cost call or class to assess interest in a more robust program? Do I need to do it via webinar (or other unfamiliar technology) or can I simply use a free conference call line? Could I design an information product myself instead of hiring a graphic designer? Can I do it without a fancy website or sales page and have sales conversations instead? Look, it’s going to happen anyways: The first time you offer something, it’s probably not going to be as good as the 10th time you offer it. So why not own this reality and take advantage of it instead of uncomfortably trying to act like you already know everything when you don’t? And then of course, there’s the “Crickets Effect.” When you don’t beta test, you run the risk of creating an “epic” program that your target market doesn’t even need, potentially wasting a lot of time and money when people don’t sign up. But worse than crickets or pretending you’ve got it all figured out, there’s the more likely possibility that if you don’t put out a beta version, you won’t put anything out . . .
Because you are waiting for perfection. First off, let’s just send that little perfection monster on vacation. Cycles need to move. And while clarity is very important, we have to be careful not to get stuck in vision-mode. One of the biggest mistakes I see entrepreneurs make is trying to figure it all out in advance – to make their offering absolutely perfect – before they put it out there. 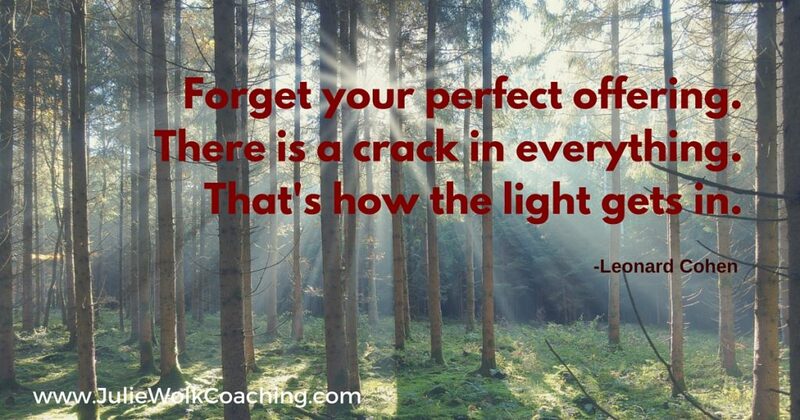 Forget your perfect offering (thank you, Leonard Cohen). And This Takes Courage, By the Way. While the reality is that nothing’s ever going to be perfect, when you’re in beta mode, things are inherently even more imperfect (that’s the whole point). But we humans don’t generally like being seen as less than perfect, so this means you’ll need to muster up some courage to put your work out there anyways. And frankly, this is what building a purposeful business is all about. Just doing it anyways even if you’re not quite ready. Because you will learn way more about how to successfully grow your business by actually doing your work and getting direct market feedback that you will from me or any other business or marketing consultant out there, or from simply planning and thinking and doing market surveys. So how about trying a beta version? 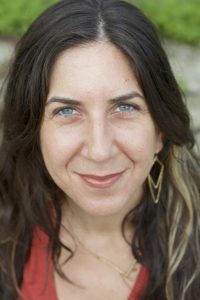 About the Author: Julie Wolk helps purposeful entrepreneurs slow down and tune into nature to find the clarity, strategy and systems to grow profitable businesses they truly love and enjoy. For 15 years she’s guided talented visionaries to manifest the success and impact they desire. People love her down-to-earth approach and that she takes into account the uniqueness of each person she works with. 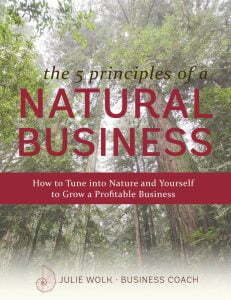 If you like what you’re reading, download Julie’s free guide: The 5 Principles of a Natural Business: How to Tune into Nature and Yourself to Grow a Profitable Business You Love.